THE PASSAGE had an unpleasant Week 2 drop. CBS: BIG BROTHER: CELEBRITY EDITION returned at 1.4. MAGNUM PI didn’t retain any benefit from its big Sunday number, down 0.1 from last Monday to 0.7. BULL gained 0.1 to 0.8. FOX: THE RESIDENT lost 0.1 to 1.0, and then THE PASSAGE fell 0.3 to 1.0. ABC: THE BACHELOR slipped 0.1 to 1.6, and THE GOOD DOCTOR was steady at 1.2. 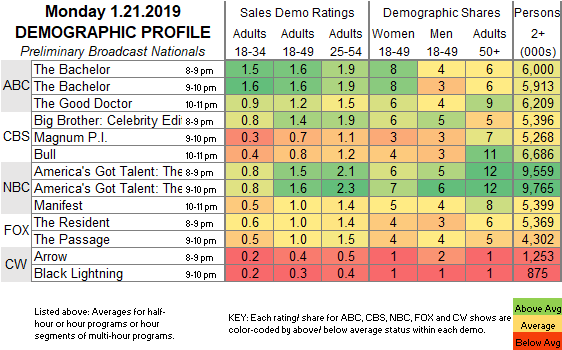 NBC: AMERICA’S GOT TALENT was down 0.1 to 1.6, and MANIFEST is up 0.1 to 1.0 (but it may have started at 10:01PM, which would make an adjustment possible). Tonight, ABC’s THE CONNERS airs its season finale, and BIG BROTHER: CELEBRITY EDITION continues its run on CBS. 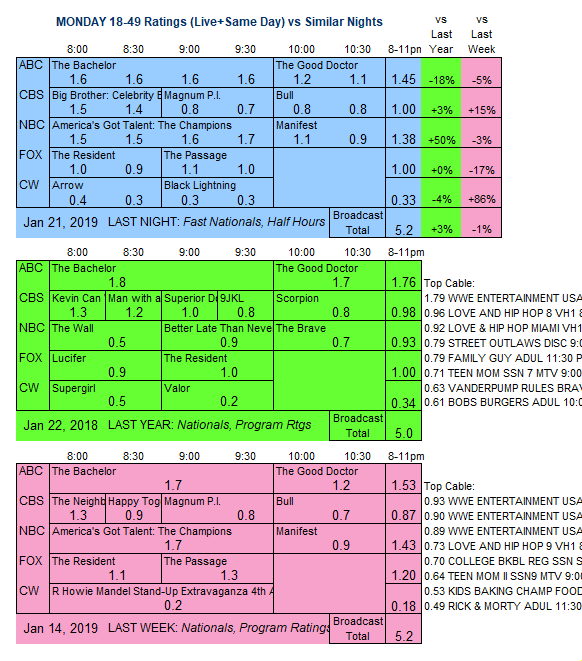 CABLE RATINGS: Come back WEDNESDAY afternoon for detailed demographic ratings for top Monday cable programs, later than usual because of the MLK holiday.